One of the UAE’s favourite sporting events, the Dubai Rugby Sevens, is fast approaching and will take place at the Sevens Stadium from November 29-December 1. Whether it’s your first time attending the event or if you’re a seasoned pro, here is a look at our top tips to help get the most out of your weekend. If you’re based around Dubai or further afield, it’s important to arrive early and avoid the entry queue, which normally starts to build around midday. Don’t be one of the people who tries to arrive fashionably late because you’ll miss all the fun. On Sevens weekend, arrive early and make the most of the day! If you have loose hips like Shakira or are simply in the mood for a consistently good atmosphere, the dnata stand is where it all happens. You might have some vocal rugby enthusiasts barking from the throngs of the upper stand, but it’s all in good spirits. If you’re looking for a break away from the dnata stand, the social leagues on pitches two and three offer a combination of solid rugby and plenty of laughs. The Dubai Sevens is all about what you wear, so if you want to stand out from the crowd then it’s advised to dress up. Some of the prominent costumes from 2017 include elves, minions, Where’s Wally, Superman, The Incredibles and even a man dressed up as a vending machine. Do your research early and give yourself enough time to buy or make a unique outfit. We all love to comfort eat at times, but with many food trucks available at the ground (Bidi Bondi, Left Bank, Giraffe), why not go for a healthy option. It’ll have you feeling mentally sharp instead of the peaks and troughs that come with feasting on greasy burgers and chips. It’s always tricky when you have thousands of people battling for taxis at the end of the night, however, last year the queues moved fast and there are even free buses available that bring people back to various locations. Another option to avoid queuing is to use the Uber or Careem apps and ask the driver to collect you at the gates of the Sevens Stadium. Barasti, Irish Village and McGettigans are the most popular venues for those making evening plans. With the weather cooling down, Barasti is the best choice and offers good music and plenty of space. If you have visitors over for the weekend, it’s a safe bet for a consistent night. South Africa coach Neil Powell has urged for caution ahead of their World Rugby Sevens Series opener this weekend as his side go in search of a third successive title in the UAE. 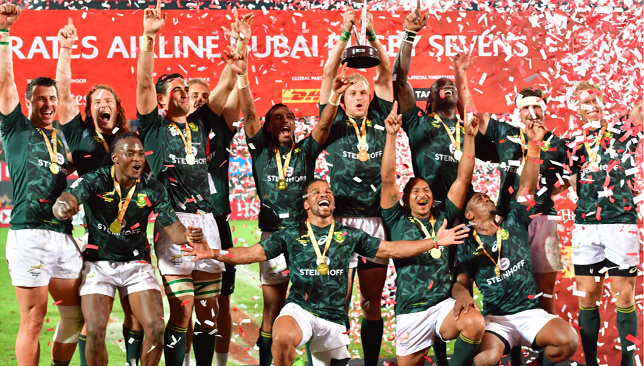 The Blitzboks are reigning Sevens Series champions and defending champions in Dubai – usurping Fiji of both accolades in 2017. And despite having a group of players brimming with talent and oozing confidence, it’s still the fear of the unknown that has Powell slightly nervous ahead of the opening tournament. “All the teams will be a threat,” said Powell at the Dubai Sevens press conference at the Crowne Plaza in Festival City. “Fiji, New Zealand, America, Australia, England can do it on their day. That’s the beauty of sevens. “There are no easy games out there anymore. It’s going to be difficult and hopefully it’s a challenge we are up for. “We need to focus on the outcome. It’s going to put pressure on us otherwise. So we need to focus on what we have control over. After using 28 players during the 2017/18 campaign, the Windhoek native has built impressive squad depth to cover key positions ahead of the start of the ten-round season. The experience comes in the form of captain Philip Snyman (65 tournaments) and Branco du Preez (61), both of whom missed out the Rugby World Cup Sevens in July‚ where South Africa claimed bronze. The side also includes the sparkling talents of Werner Kok, Rosko Specman and Kyle Brown, players who can often be the tipping point between the Boks winning and losing. And with players of this calibre at his disposal, Powell has experience and class to help their drive for a sixth title in Dubai. “I’m happy with the balance. I’m happy we have some senior guys to add experience and give some guidance,” he said. “We will look to those senior guys to make their own decisions on the field in those crunch games where one decision can be the difference between winning and losing. With Seabelo Senatla, Dylan Sage, Tim Agaba and Ruhan Nel having made the switch to fifteens rugby, Powell has ensured that his side remain a competitive force by giving newcomers good opportunities and blending in experience to add steel in those crunch encounters. 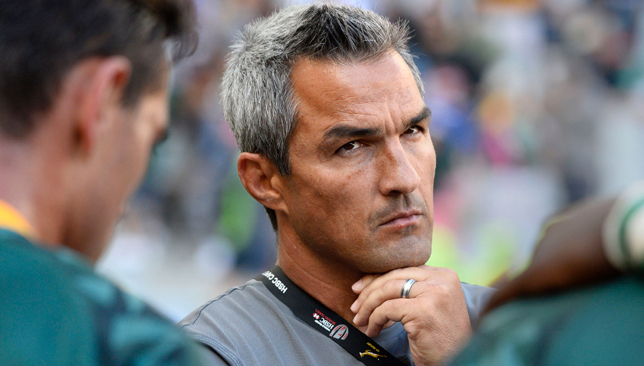 However, for all their class, the Blitzboks have shown they are more than capable of managing without star players, and while the likes of Senatla will be sorely missed, there are no gaping holes in the squad. “We’ve planned for it. When we took that young side to Hong Kong last season, people were saying, ‘what are you doing, you still need to need the world series.’ We knew we’d lose players to fifteens and we needed to build a bigger base to select from,” he said. The Blitzboks will take on Zimbabwe, Samoa and Argentina in Pool A on Friday. New Zealander Schmidt had been regarded as a future All Blacks coach, but he has announced that he will finish coaching following next autumn’s tournament in Japan. “I have decided to finish coaching and will prioritise family commitments after the Rugby World Cup in 2019,” Schmidt told the official Irish Rugby Football Union website. Schmidt, 53, was appointed in 2013 after three years in charge of Leinster and has overseen the most successful period in Ireland’s history. Ireland have won three Six Nations titles under Schmidt, including a Grand Slam in 2018, and risen to the number two spot in the world rankings. They have beaten all three southern hemisphere super-powers with a first win on South African soil in 2016 and a series win in Australia in 2018. Ireland recorded a first win over world champions New Zealand in Chicago in 2016, a triumph which they repeated in Dublin nine days ago. “Thank you to the IRFU for their support and patience and thanks also to so many people who have adopted my family and me, making us feel part of the community here in Ireland,” said Schmidt, who was named 2018 world rugby coach of the year on Sunday. Farrell, who was capped as a player by England in both union and league codes, is considered one of the best defence coaches in world rugby. 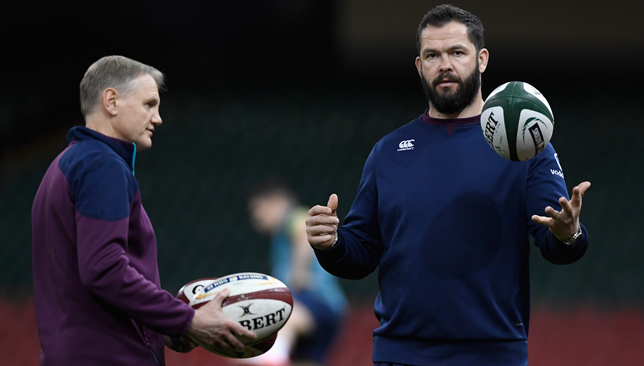 The 43-year-old joined Ireland in 2016 after spells with England and English Premiership side Saracens, and was part of the coaching set-up on the last two British and Irish Lions tours under Warren Gatland. “It is a privilege to be considered for such a prestigious role,” Farrell said.